Thanks for this timely review. I was going to try to see before our trip but now based on your comments I will wait until I can get in on-line. Not into super hero or heroine movies. The implausibility of the plots and the violence that seems to be essential to the story is a total turn-off for me. I like that you are going outside the box and offering movie reviews! I just saw the movie today and have a different perspective or expectation for the movie. It’s a takeoff on the comic hero and this case a Wonder Woman. The visuals were quite good and the sound, well, I guess it goes with the territory. The ending definitely sets it up for a sequel or two or more. The movie previews included a movie with Bat Man, Aqua Man and Wonder Woman. 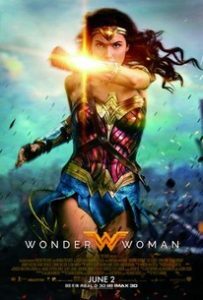 There is a lot of positive conversation outside the movie about the female director, Patty Jenkins (or close to that name). Ah, I love different perspectives!! Thanks, Leslie! More inspiration for others to see it and opine!